When you feel stuck in your business, it’s normal to want to hire help to fix that problem for you. It’s something every one of us needs to do at some point, but there is a difference between hiring help to help your business grow or hiring help to solve your business problems for you. So many entrepreneurs spend money on hiring people to figure solutions out for them when they can’t figure things out themselves. I had a similar situation myself a year into running FEA. I wanted to get a business grant that was available for $100,000 and I remember thinking if I got that grant, I would be able to hire people to help me figure out how to grow FEA. But I started thinking, if I did have that $100,000, who would I even hire and what would I have them figure out? I was trying to grow the business and was well out of my comfort zone. I was doing things I had never done before and didn’t know how to do, so my first instinct was to find someone to do it for me. But as entrepreneurs we need to be problem-solvers and we need to be able to figure things out for ourselves so that we can grow and develop. When you decide to figure things out for yourself rather than hiring someone to do it for you, you grow into the business leader you need to be in order to take things to the next level. If you simply hired people to do everything for you, you would inevitably end up not knowing how to do anything or understanding how your business actually works. 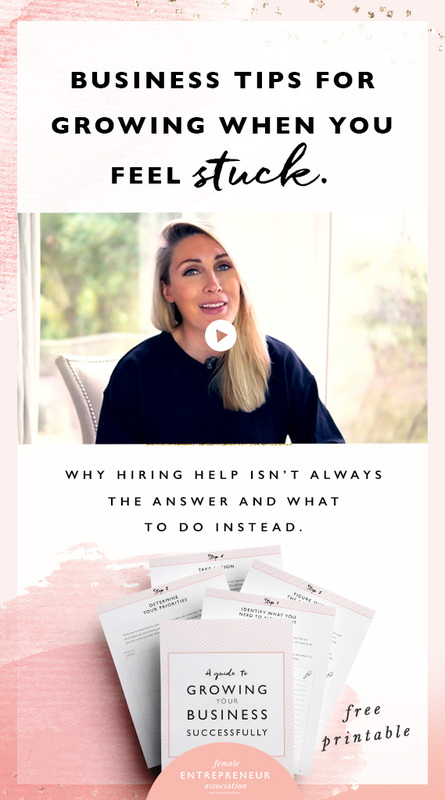 In this video I share why hiring help isn’t always the way and why both you and your business need to be 100% ready before taking this step. Ask yourself these questions before you decide to bring anyone onto your team. Take some time and think about what’s holding your business back, and what it is that you need to figure out. Once you’ve made that list, have a good think about the priorities. What are most important and pressing points that you need to work on and figure out? After you’ve prioritised your list, you need to understand who or what will help you to figure out the solutions to these issues. Is it something you can learn? Is it something you can research? Have you got the solution and it’s simply the implementation you need help with? Once you know what people or resources can help you overcome these hurdles, take action! Put in the effort to get what you need! You will have moments when you feel overwhelmed and confused and you will be pushed outside your comfort zone. But you need to be prepared to push through that and figure it out anyway, no matter how long it takes. You need to put the effort in to figure this out in order to grow into the entrepreneur you need to be to create your wildly successful business. Let us know in the comments below: Would you love to hire help in your business? Would you know how to manage your employees to get them to execute your vision?